The Media Tools addon also has an integration with Elementor to allow configuring the settings inside the Video widget. 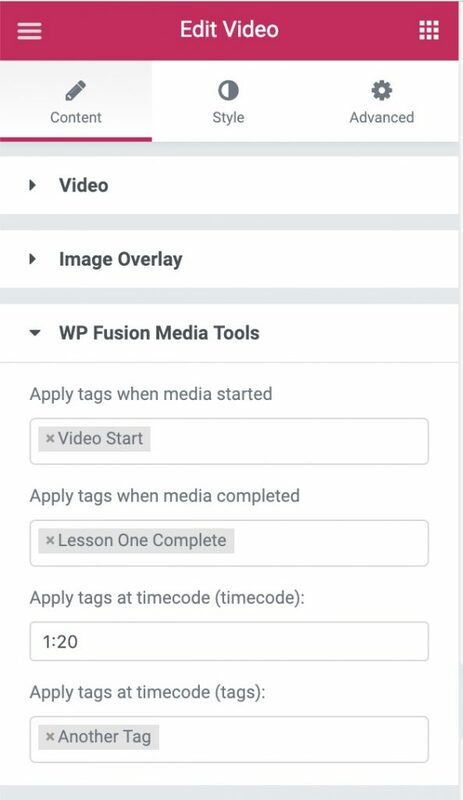 These settings appear in the WP Fusion Media Tools panel, and are the same as the options when using the Classic Editor. Apply tags when media started: These tags will be applied to the user as soon as they click the “Play” button. Apply tags when media completed: These tags will be applied to the user once the media file completes playing. Apply tags at timecode (timecode): Enter a timecode at which additional tags (configured in the next field) should be applied. Timecode can either be in seconds (like “45”), or in delineated time notation (like “1:45”, for 1 minute 45 seconds). Apply tags at timecode (tags): These tags will be applied when the timecode specified in the field above is reached.